Welcome to the official Tamegonit Lodge Website! 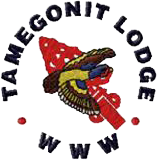 There are many resources and tools available on this website that will assist you in learning more about Tamegonit Lodge. If you see a link in the text you are reading, feel free to click on it. You may discover something new about your lodge. The greatest source of improvement in Tamegonit Lodge is you, and we strongly encourage you to get involved. If you would like to get more involved, contact a member of the Key 3. Join our conversation on Facebook about being the largest lodge in the nation and everything else OA in Heart of America Council!